The Dolphin Royal Swim at Cove Cayman is an action-packed program that lets you experience dolphins in their natural habitat. Exciting activities you can partake in with the dolphins include the dorsal tow and foot push. After being pulled and pushed across the water at fast speeds, you can take a breather by hugging and kissing the dolphins. 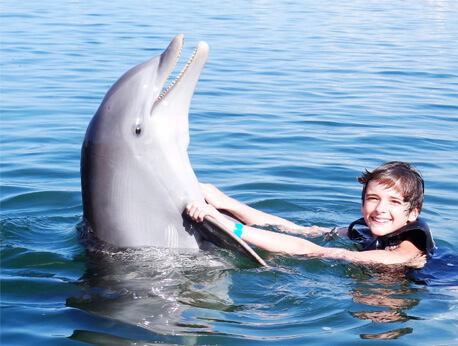 The Dolphin Royal Swim experience only allows up to 10 people in each group to ensure everyone spends adequate time bonding with the dolphins. The Dolphin Royal Swim at Cove Cayman is an exhilarating program ideal for people who love action and speed. You can fly across the water with the help of two dolphins pushing from the soles of your feet or you could zoom across the water while holding onto two dolphins. The Dolphin Royal Swim lasts for 30 minutes and groups are limited to up to 10 people, so you will have a lot of one-on-one time with the dolphins. You and your family will have enough time to get the full experience including: the dorsal tow, foot push, handshake, hand targeting, kisses, and hugs. Before you hop into the water with the dolphins, you'll notice some like to show off by performing tricks or just by being naturally adorable. During the program, you'll get to hear the dolphins sing a song too! Dolphins have sophisticated forms of communication with each dolphin having a signature whistle that allows others to identify them. While swimming with the dolphins, you'll realize that dolphins are highly intelligent and compassionate. Researchers have witnessed dolphins teaching their young how to use tools, such as a sponge attached to their snouts for protection while foraging. There are also many instances of dolphins saving humans, whales, and other dolphins. You'll love finally being able to meet a real dolphin and interact with it. The Dolphin Royal Swim experience doesn't come with pictures, food, beverages, towels, transportation to the venue, or other activities that are offered in Grand Cayman. Please use biodegradable sunscreen as well to protect your skin, the dolphins, and the environment. Remember to bring towels for drying off once you get out of the water and cash (pesos) for purchasing food from nearby restaurants. Many places don't accept debit or credit cards in Grand Cayman, so you'll want to keep cash on-hand for those instances. For safety reasons, pregnant women (5 months and up) can't participate.